It’s Bear vs. Ranger in the funniest food fight ever! Mac and cheese, carrot cake, meatball stew: Bear loves when campers leave him grub. The park ranger does not. Smackity smack, Ranger pounds a sign into the ground: DON’T FEED THE BEAR! Upset—no more chewy cookies? No more juicy burgers?—Bear quickly crosses out the “DON’T.” Now, it’s war in the park! But when both Bear and Ranger end up losing out, will the two antagonists finally call a truce? If you’d like a personalized copy, please call South Shore Arts Gift Shop and spell the recipient’s name. After I sign the book, the gift shop will mail it. Kathleen Doherty is a Reading Specialist and an Educational Specialist in Curriculum and Instruction. She’s written standardized test items for Pearson, Inc. in alignment with the Common Core Standards. 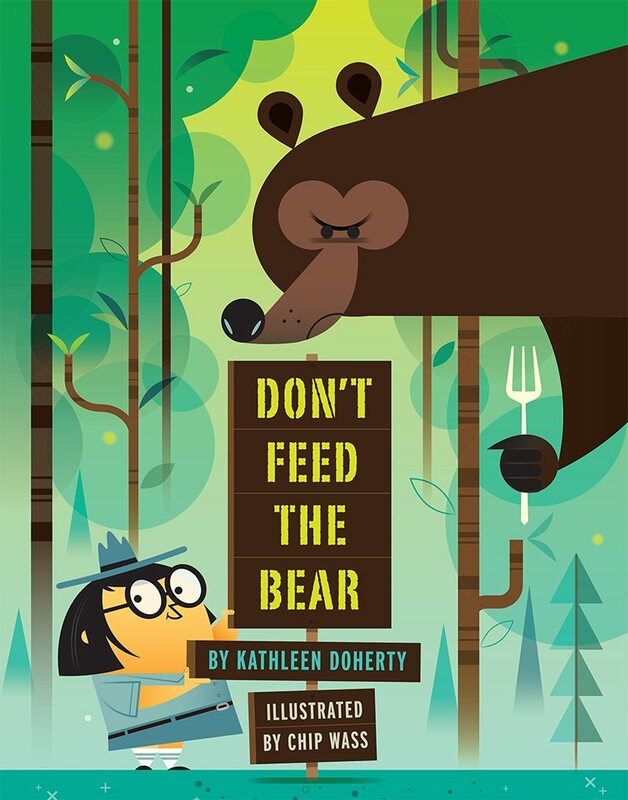 She’s also won the Highlights Pewter Plate Award, the Highlights Celebrate National Poetry Contest, and a letter of merit from SCBWI’s Magazine Merit Competition. Chip Wass is an award-winning artist who designs characters and illustrations for Disney, Cartoon Network, The New York Times, ESPN, and Wendy’s. His previous books include Monster Knows Patterns, and Monster Knows Numbers (Picture Window Books). Learn more about chip at chipwass.com.